The Truth of the "time" we are in ...ground temperature readings from above. Here is a dream I had today...i was a little stunned upon seeing what had happened, and had a hard time at first trying to write it down on the computer. In a dream…It was though I was watching near the boarder of Mexico and even near Los Angeles. And on the California side I was looking at ground temperature readings from above. And I was home here in Oakland, monitoring it online as though from a computer. Yet at first it was like watching it from above the earth. Now I saw a matter of the ground temperature as it began to change from one temperature to another. Now in one spot, the temperature was very unusual, for the ground temperature was though at first 400+F degrees. And there were hot spots in different areas. Then I saw as I was though looking from above, the temperature turned from the hundreds, and went into the thousands, and then I saw as the temperature went up and down. And this was near Los Angles down towards the south east direction of the boarders of California. Then did I see that the temperature increased dramatically, as it turned to 201,000+F degrees and when I saw that, I said, "Something's going to happen". And a name even came to mind and it was Vesuvius. And the location was in as though Mexico, near the boarders of California. And I was looking towards the south and even like I were in California from above and like near Los Angles or somewhere in the lower parts of California. And so, I saw a scene, where my perspective was now near ground level. And I began to see lava flowing, and spewing without stopping and I saw a city with buildings being consumed by the flow of the lava, and the flow of it was going towards my right even like towards the north even towards and in Los Angeles. Now the scene changed as I was at home here. And I was looking out a window towards the south and I saw clouds of ash rising from the earth into the sky and it was massive beyond anything I have ever seen. 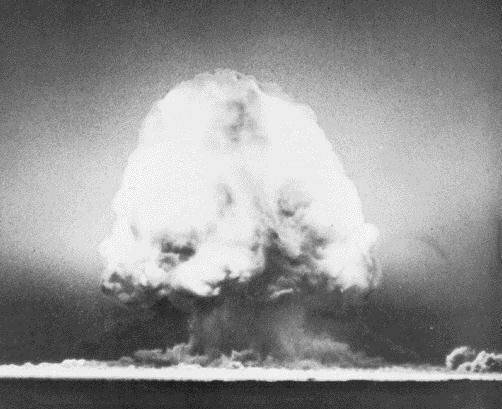 And the shape was that of a tall mushroom cloud even as this yet the top part much taller and wider and more perfect in shape. And the color of the cloud was grey even also a bit like silver and there was another cloud behind it that was as a pure white cloud. And I saw as though even what looked to be a jet or plane, yet could have been debris from the explosion, and it slightly wobbled or curved in a way as it was flying in the air slowly. Now at this point, I was near the vent (from the central gas/air) that is on the floor of our dining room and I began to see and feel white steam coming out of it. And when I saw that, I knew we had to get out of here. And I told my husband who at first seemed reluctant, and I told him we need to get out of here! The ground around us is heating up! And I felt the warmth of the heat. So I grabbed my son, ran to the closet to get our important documents and money, grabbed water bottles and placed them in a white plastic bag…I grabbed little bags of chips from the top of the cupboards for my son…I grabbed my jacket…and knew the only thing I could bring to wear was what was on my back at the time. And we had to explain to my mother and uncle we needed to leave. And my husband told my mother what to bring and he also mentioned to take as though a piece of jewelry or necklace, as though she were going to visit a friend or a relative. And we had to get out of there fast! And after this I woke up alarmed…and walked into the front room to tell my husband all that I had saw. And when I came to write it down on the computer, I began having a hard time writing what to say...and this is as best I could explain what I dreamed and as best I can remember of it for now. But before the scene of this volcano, I saw my sister in law and her son came over. And her son and my son did play together. And I saw as though the phone rang and there was a matter of a woman and I heard her message, and she was asking for my mother as though to talk to her about my dad…for she said like, this is regarding your husband, we have to figure out where he is going to go. And it was like it was time for him to leave from where he was. And I saw my uncle as though he were in the front room here watching a program and I saw I gave him a chair to sit on, but I saw latter on that he fell asleep and was slouching and was almost tilting towards the floor and so I got him and helped him back into his room. And I remember there was though a teacher I had and she was calling me ever so often to make sure if I got my work done or if I got my work and other such things…and that is as best I can remember of this dream for now.